The RJD legislators sat down on the road in front of the bungalow’s gate and chanted anti-government slogans. 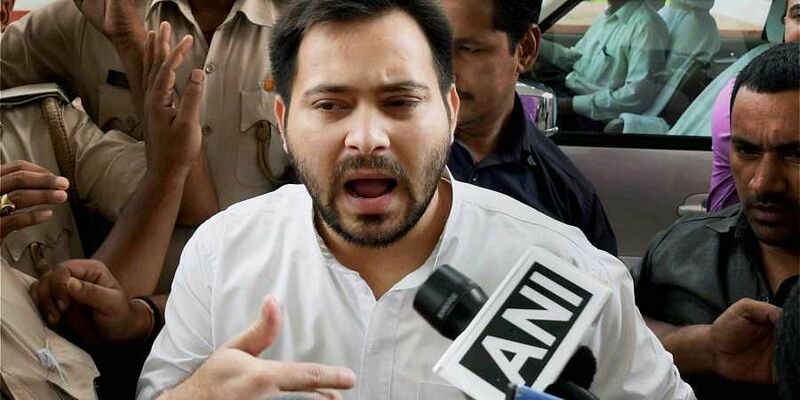 PATNA: Bihar’s Nitish Kumar-led NDA government on Wednesday made an abortive bid to evict Opposition leader Tejashwi Yadav of RJD from his official bungalow in Patna, prompting the Opposition parties to accuse the government of practising “vendetta politics”. The eviction attempt, initiated when Yadav was away in New Delhi, swiftly drew protests from several RJD legislators, who gathered in front of their leader’s 5, Deshratna Marg residence and vowed to foil the attempt. The legislators sat down on the road in front of the bungalow’s gate and chanted anti-government slogans. Officials of the district administration, who had come accompanied by policemen to execute the state’s building construction department’s eviction order, left the site without taking any action after being informed that the case regarding the bungalow was pending in Patna High Court. Yadav, who served as Bihar’s deputy chief minister in the erstwhile Grand Alliance government led by Kumar till July 2017, was asked by the new NDA government to vacate the bungalow so that the current deputy chief minister, Sushil Kumar Modi of BJP, could occupy it. But Yadav had refused to vacate and challenged the government’s order in the HC. “After a single-judge Bench of the HC asked him to vacate the 5, Deshratna Marg bungalow on October 6, Yadav filed an appeal before a double bench. Even as that appeal is pending, the government has now ordered this cowardly eviction bid as part of its vendetta politics,” said senior RJD legislator Bhai Birendra. Yadav, who returned to Patna in the afternoon, excoriated CM Nitish Kumar on the matter, accusing him of practising double standards over-allotment of bungalows and harbouring jealousy towards him. “Nitish Kumar can do just anything. He puts a CCTV camera facing my residence, changes political alliances opportunistically, patronises criminals… His name is Nitish Kumar. He is Paltu Ram (one habitually changing allegiance). He can do anything,” said Yadav. “I wonder why he has so much hatred and jealousy for a very young leader like me,” he added. The ruling JD(U) and BJP ridiculed Yadav and his party. “By obstructing government officials from discharging their duty, RJD’s MLAs and former ministers supported their leaders’ undue love for public property. This seems to be their hereditary trait. Lalu and Rabri had also taken eight months to vacate the CM’s residence after losing power,” said JD(U) spokesperson Ajay Alok.